Rubik’s Cubes or magic cubes from China are as old as the Internet mail order business itself. A particularly smart model is the Giiker Supercube i3. 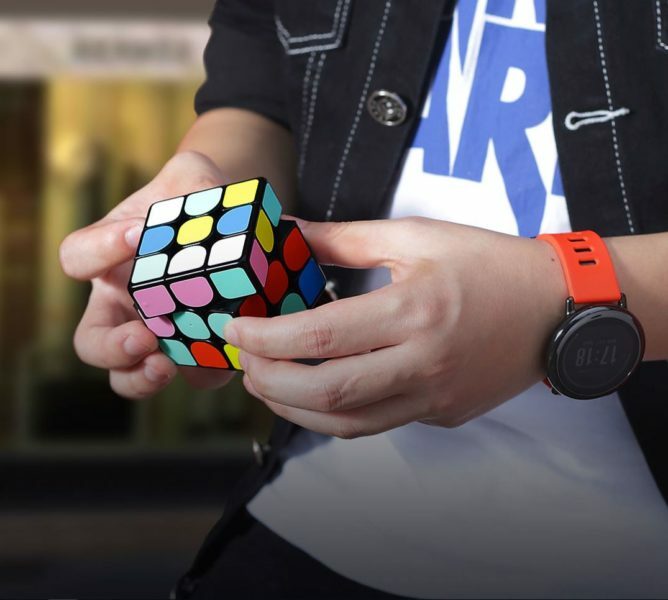 The magnetic magic cube is connected to the smartphone or computer and enables tracking of every single movement and many other functions such as tutorials and games. We tried the cube ourselves. 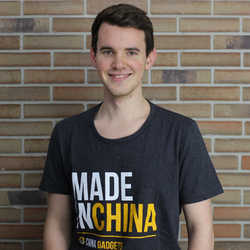 In almost all stores and reviews you can also find the name “Xiaomi Giiker” or “Mijia Giiker”. As so often, this is because Xiaomi sells the cube in China, which is the reason for the very chic presentation. 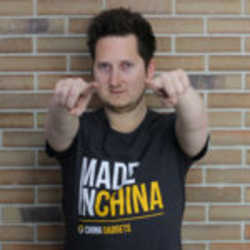 But the Xiaomi logo is not found on the cube. 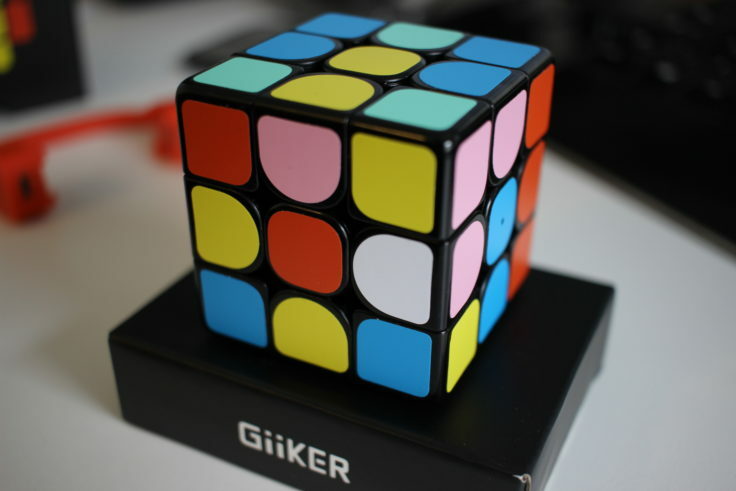 Also, don’t confuse it with the Giiker M3, which looks the same on the outside, but is an ordinary magic cube. Xiaomi delivers beautiful photos again – and still manages to accommodate its own products like the Amazfit Pace. 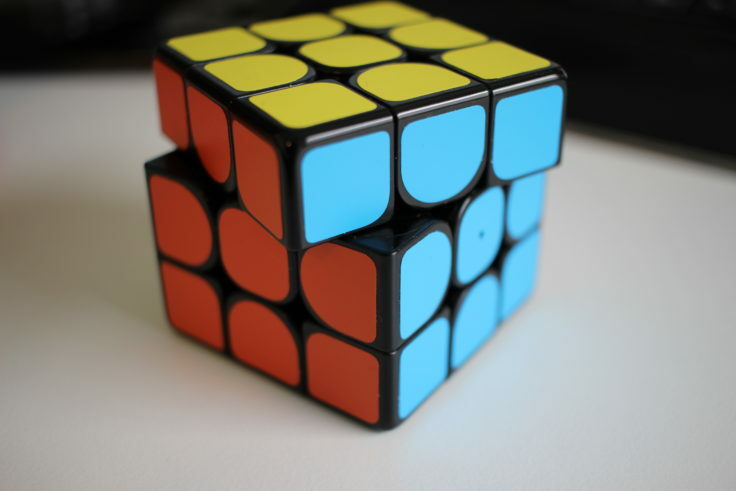 Just to mention the differences to a “normal” Rubik’s Cube: A Smart-Cube allows you to monitor your actions by sensors in the cube. 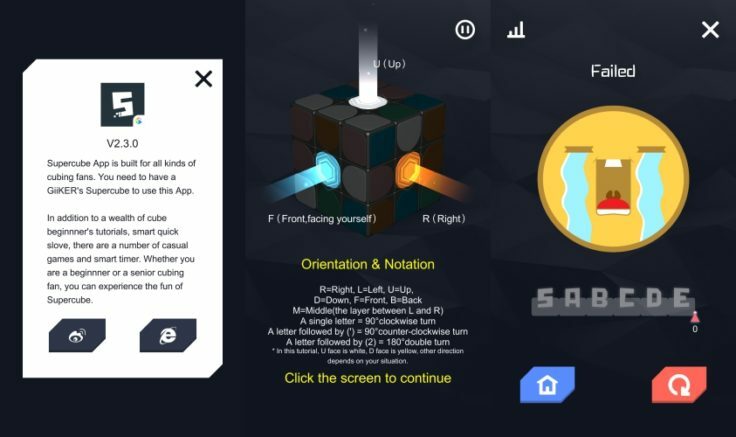 The app Supercube (for Android and iOS) shows you all movements of the cube. In addition, the cube automatically takes your time. The somewhat unusual choice of colours is directly conspicuous. Instead of a red side we find one in pink and the green goes very strongly into a bright turquoise. 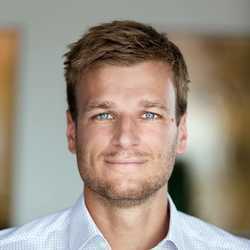 This doesn’t change the principle, but can be unusual if you change from or to a cube with an “ordinary” color scheme. The overall workmanship is good to very good. The cube has a good corner cutting, so it can be turned perpendicular to the twisted plane even in a slightly twisted position, as the individual stones are movable. Even in this position, the right blue side can still be turned. The connections are these holes on the green and the (opposite) blue side. 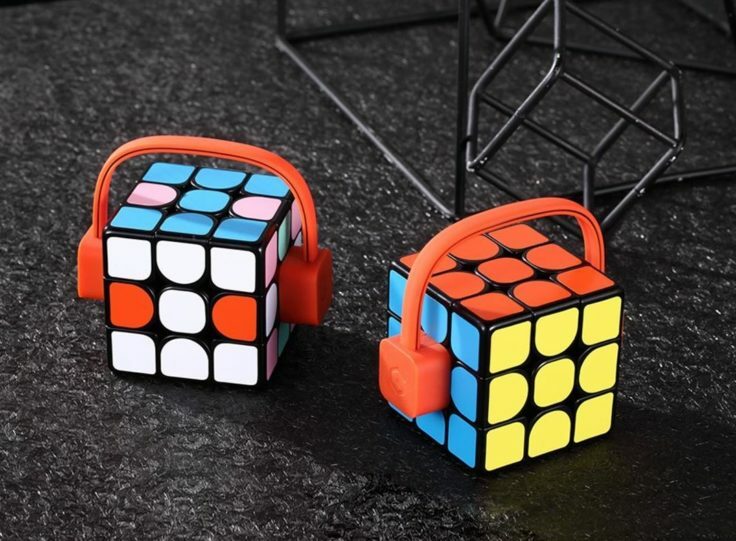 The battery in the cube lasts up to 30 hours and is charged using the included adapter (the one that looks like the cube is wearing headphones). The connection to the smartphone is of course established via Bluetooth. The app is easy to download from the Google Play Store or App Store. 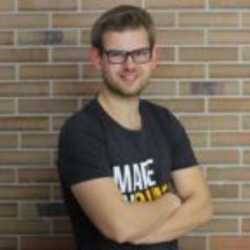 After starting the app, the cube can be connected via Bluetooth. Of course, the cube should already be charged; it can be activated by any rotation. You can use the app in three ways. 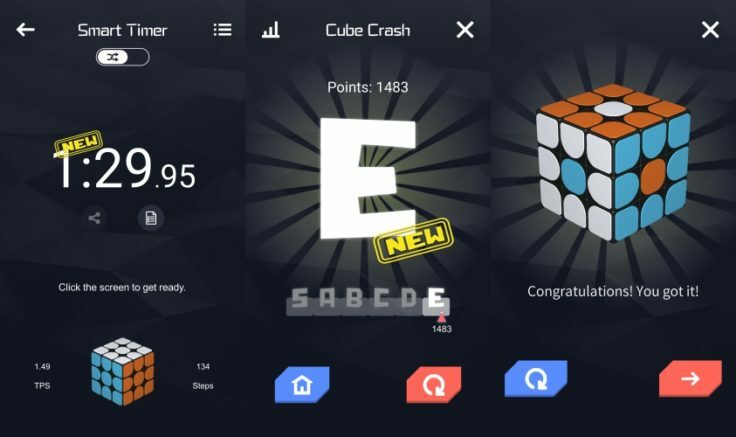 Beginners can learn the basics of the cube solution step by step. 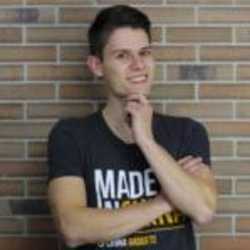 There is a multilevel tutorial that asks you what you have learned after each step. It starts off a bit wacky by assigning roles like king, sorcerer and warrior to the individual stones, but then quickly moves on to the commonly used notation of movements. The app teaches the basics, but also evaluates your progress. Once you have mastered all the steps, you can try to improve your time. 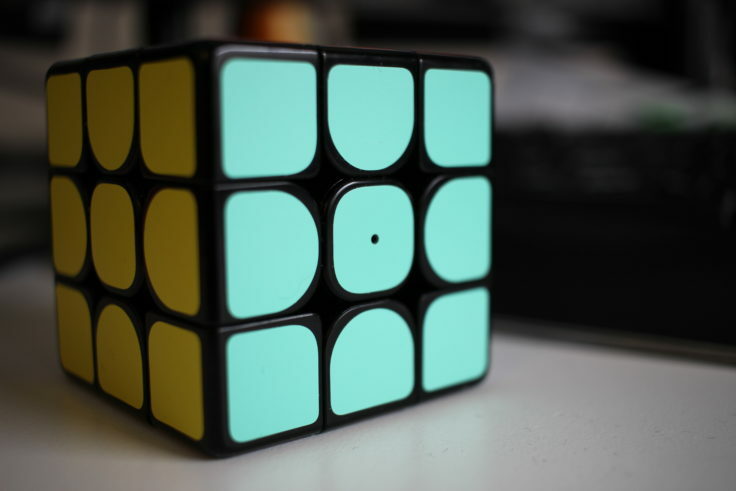 Here you can either scramble the cube itself or let the app tell you how to do it. The time starts either with the first movement or after a countdown. The actual state as well as every movement of the cube will be displayed on the screen in real time. All in all a good way to take your time and see progress. The results are saved so that you can track your personal high score. Last but not least, there are various “games” in which you will need to recreate predefined patterns, for example, or even a format reminiscent of Guitar Hero by hitting falling notes by rotating one of the six sides. Sometimes the steps you can use to solve the problem are limited, and sometimes you play against the clock. The selection of games is varied and appealing, but I have to say that I find them too demanding for beginners. 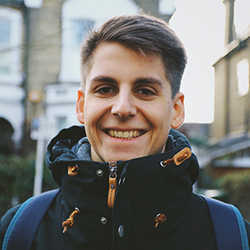 I myself can solve the dice in just under a minute by simply following the algorithms I’ve learned, but almost all the games are just too fast for me. As someone who once tried his luck with the Rubik’s Cube, I find the Supercube very interesting. I’ve never been on a competitive level with my times (not even close), but trying the different games with the app has been fun so far. 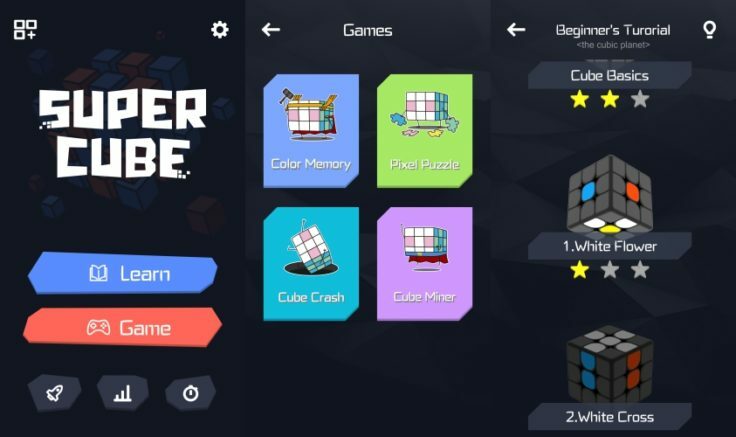 I also believe that – if you have time and patience – you can learn the necessary algorithms with the Supercube i3 and its app even as a beginner. In the end there is simply the price of almost $40, which you pay for the fun, because you can get good cubes to practice for under ten. Here you can find the manual and the possibility to take the time with it. 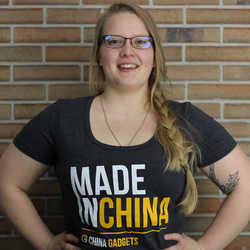 What do experienced speedcubers have to say? And if you’ve never come into contact with the topic at all, what do you think of it? The app only seems to support the Chinese language, is this correct? It is available in English as well.